Though, really should be the mainstream of everybody’s lives but being real at each and every point of life is not possible. Have you ever clicked your photos or have you ever made your videos and posted on social media without editing? I think, you have done it at least once in your lifetime. Though, the actual videos are good but you can make them better with the video editing software like Movavi Video Editor Plus. Movavi is a company which offers the editing the photos and videos so that you can upload the better pictures or you can have the better memories as well. Usually, there are several software available on the internet. Some of the software are paid whereas some of the software are absolutely free. It has been observed that the paid software are always better as compares to the non paid software. But buying is paid software is also not possible for everyone because the paid software are too expensive. This article is important for you because here, you will get to know about how to get heavy discount on buying the software or how to get the gift cards while buying the software. You must have heard about the discount on clothing, food, electronic items on the special occasions, but now you can get the discount on software as well. If you are in search of finding the best Software for photo editing, you can grab the best opportunity available for you. You can get the heavy discount of 80% on the purchase of Movavi software, if you will follow below-mentioned steps. Step 1: As everyone has the Facebook account, you can create a Christmas post with hashtag #happynewmovavi and share the page https://www.movavi.com/happy-new-movavi on your page. Make sure the Facebook page you share is public and anyone on or off Facebook can see it up till December 27, 2018. Step 2: Once you have created the hash tag, you can share it on your Facebook page right now. Step 3: Now, you have to wait for 27th December and you will get the price on the drawing day. Till then you have a possibility to get Movavi Video Editor Plus or Movavi Photo Editor and save up to 80%. Movavi Video Suite now offers convenient video editing, screen recording, and media file conversion. Share videos online, copy them to CDs, DVDs, or Blu-rays, and digitize your VHS tapes. Even if you don’t want the software for you, you can share it with your friends as a present. You can also giveaway this present as New year gift or Christmas gift. 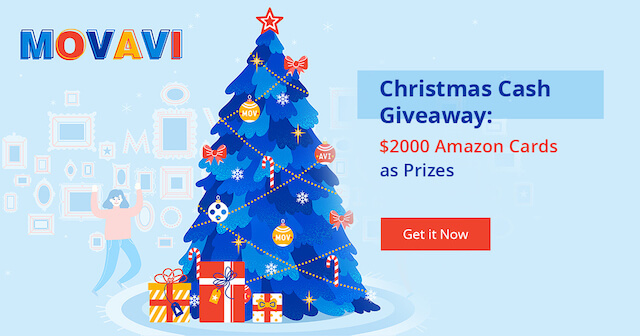 If you are not interested in making a purchase of Movavi software, you can get the Amazon gift card of 50$ and you can go shopping with the same. I know, some people love shopping rather than buying a software, especially girls. So, you can get an Amazon gift card worth 50$ and you also have to follow the above-mentioned steps. The same you can get on the drawing day, i.e., 27 December, 2018. The company is giving away the total Amazon gift cards worth 2000$. You can also share this offer with your friends and family, so that they can also get the opportunity of getting the Amazon gift card. Grab this opportunity right now for availing the benefits of Amazon gift card.